Infrared (IR) cameras, which capture infrared energy instead of visible light, serve many useful functions in enterprise. The IR energy provides a sixth sense view of heat. The military used such devices for years to “see through” objects in either day or night. And now, IR cameras are showing up in mobile phones. 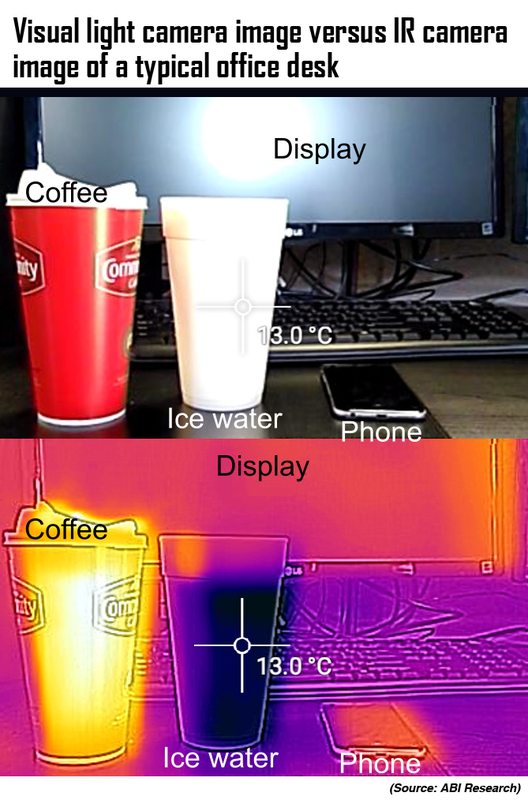 In its recent teardowns of the world’s first thermal imaging smartphone, CAT® S60, and the highly publicized and recalled Samsung Galaxy Note 7, ABI Research finds that the new trend of incorporating IR cameras into mobile phones is only just heating up. Heavy machine operator Caterpillar designed the CAT S60 to provide an inexpensive solution to enterprises looking to use thermal imaging in the workplace. The phone allows workers from manufacturing to field services to capture thermal images that detect changes in heat up to 100 feet away and can read specific temperatures between 50 and 75 feet from the user. The phone integrates a FLIR™ IR camera, in addition to a normal 13MP rear and 5MP front camera. The Samsung Galaxy Note 7, on the other hand, incorporated an IR camera not for photos but for security. ABI Research finds that the front-facing IR camera uniquely identifies the phone owner by characteristics of their eye, taking biometric identification to the next level. These findings are from ABI Research’s Teardowns, which include high-resolution photos and x-rays, pinpoint power measurements, detailed parts lists and block diagrams.